You thought you were going to see another bird? 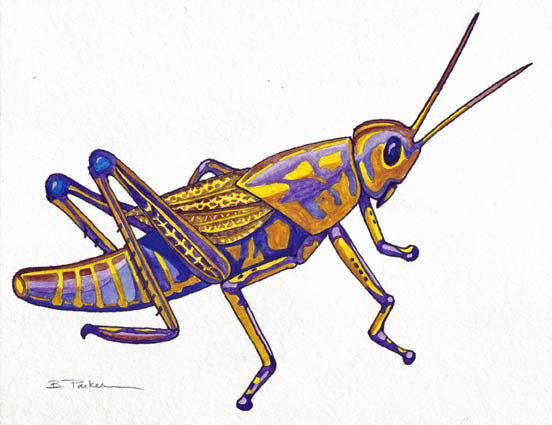 I slipped this little grasshopper in among the birds for fun. We’ll return to our regularly scheduled program tomorrow. Has anyone ever seen the periodical cicadas? They only appear every 13 to 17 years. They mature underground for all those years, then emerge to fly around and mate. They have been surrounding us for the last few weeks. They are loud and abundant. We have them in our neighborhood, but they don’t have them in town. Weird!!! Theodor Seuss Geisel, the beloved Dr. Seuss, is renowned to generations of children as the author of Green Eggs and Ham and other deliciously absurd picture books. He was born in 1904 in Springfield, Massachusetts. His first book, And to Think That I Saw It on Mulberry Street, was rejected 27 times. He wrote The Cat in the Hat after Houghton Mifflin asked him to write a children’s primer using fewer than 250 easy-reader words. He died in 1991.